This publication is a practical and comprehensive guide for seasoned family law attorneys and other attorneys who handle family law matters in Pennsylvania.  The publication provides insightful commentary, practice information, and several forms. 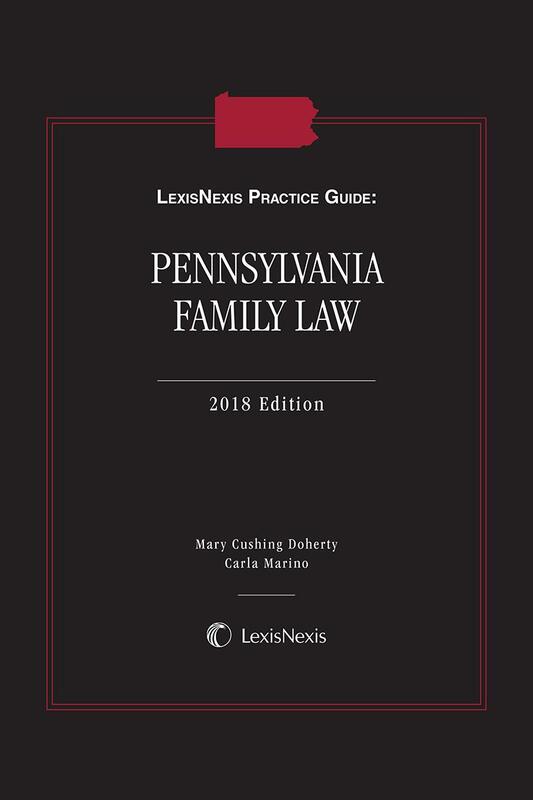 LexisNexis Practice Guide: Pennsylvania Family Law provides practical and insightful guidance on all aspects of a family law case for seasoned family law practitioners and other attorneys who handle family law matters in their Pennsylvania practice. 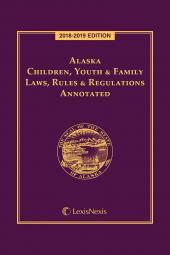 The guide provides commentary, practice information, case summaries, and several forms. In addition, each chapter of the guide includes practical checklists to assist practitioners in the identification of important points of law and issues in the different types of family law cases. 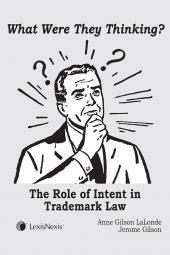 Each chapter also identifies the key provisions of the relevant Pennsylvania statutes and rules discussed in the chapter. 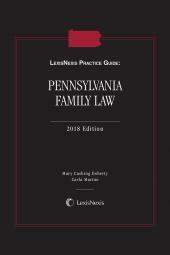 This publication is authored by two respected and recognized practitioners who frequently lecture and instruct on family law topics and whose years of experience and practice in family law and engagement in the family law community in Pennsylvania is reflected in the comprehensive, practical, and insightful guidance provided in this book. Mary Cushing Doherty is a Partner in the Norristown and Doylestown, PA, law firm High Swartz, LLP. She has a distinguished record of advocacy and teaching in all areas of family law: divorce, equitable distribution, spousal and child support, alimony, tax issues, custody, as well as drafting marital settlement agreements and premarital agreements. She has served as litigator and appellate counsel, arbitrator, and mediator. Mary served as Chair of the Family Law Section of the Philadelphia Bar Association, Co-Chair of the Family Law Committee of the Montgomery Bar Association, Chair of the Family Law Section of the Pennsylvania Bar Association, a Director of the Pennsylvania Bar Institute, and President of the Pennsylvania Chapter of the American Academy of Matrimonial Lawyers. Currently, she is a legislative advocate for the Pennsylvania Bar Association addressing family law legislation, and she serves as Co-Chair of the Legislation Committee of the American Academy of Matrimonial Lawyers. Mary recently completed her service as Pennsylvania Chapter Representative to the American Academy of Matrimonial Lawyers Board of Governors. Mary has taught and served as Course Planner for the Pennsylvania Bar Institute, Pennsylvania Chapter of the American Academy of Matrimonial Lawyers, Pennsylvania Bar Association Family Law Section, Montgomery Bar Association, Bar Association as well as the Doris Jonas Freed Family Law Inn of Court. In 1997, Mary, with the Pennsylvania Bar Institute, received the national Award of Professional Excellence in Programming from the Association for Continuing Legal Education for the PBI Course: “Drafting Marital Settlement Agreements”. Mary recently published her article “Romantic Premarital Agreements” in the American Academy of Matrimonial Lawyers Journal, Volume 29, 2016. She has presented case updates for the Pennsylvania Institute of Certified Public Accountants (PICPA) annual Family Law Seminar, the “Dollars in Divorce” lecture, from 2003–2015. Since 1995 Mary has been an adjunct instructor on family law for Upper Dublin High School’s Child Development II course. Mary has been recognized as a Philadelphia Business Journal Woman of Distinction in 2009, among the Women’s Yellow Pages Women of Accomplishment (24th and 25th Editions), Suburban Life Magazine Awesome Attorney in 2011, a Legal Intelligencer 2012 Women of the Year recipient and received the Pennsylvania Bar Association Lynette Norton Award for skills in advocacy and mentoring in 2012. Mary has been listed in Best Lawyers in America® (Philadelphia-Family Law) consistently since 1995. She has been recognized as a Super Lawyer in Family Law in Pennsylvania every year since inception in 2004. Carla Marino is a Partner in the West Chester, PA office of Lamb McErlane, PC. She focuses her practice in all areas of domestic/family law including equitable distributions, support, and custody issues. Prior to her practice in family law, she worked at a former Big Five firm followed by her work at Pepper Hamilton, LLP in their State and Local Tax Departments focusing on business transactions. Carla is an adjunct professor at Rosemont College in Philadelphia teaching mediation in the undergraduate and graduate programs. She is actively involved in the Doris Jonas Freed American Inn of Court, which promotes the collegiality and the continuing education of family law practitioners. She also volunteers her time for pro bono custody matters through the county bar associations and is affiliated with the Women’s Resource Center. Additionally, Carla is a member of CLP—the Collaborative Law Professionals of Southeastern Pennsylvania, which is committed to a mediation/goal oriented and non-litigious method for resolving domestic matters. Carla lectures frequently before professional groups on topics related to domestic relations law, such as mediation, custody issues, the Collaborative Divorce Process, Taxation issues, recent case law, and rule changes. She was the featured speaker on Domestic Law and Mediation at Rosemont College. Carla is also a contributor for the Pennsylvania Bar Association: Family Lawyer Case Notes on topics of current law, and she is a member of the Pennsylvania, North Carolina, and District of Columbia Bar Associations. Carla graduated from Loyola University Maryland (Sellinger School of Business), Baltimore, MD (1989); The Thomas M. Cooley Law School (1995), receiving her J.D. ; and Georgetown University Law Center (1996), receiving her LL.M. in Taxation. During her time at Georgetown, Carla earned a Fellowship with the Committee on State Taxation (COST) located in Washington, D.C. She worked with COST to preserve and promote equitable and nondiscriminatory state taxation of multi-jurisdiction entities. Carla is licensed to practice law in Pennsylvania, North Carolina, and the District of Columbia. She is also admitted to practice before the United States Supreme Court and the United States Tax Court. Carla has been recognized as a Super Lawyer in Family Law 2015–2017. She was also recognized as a Top Lawyer for Main Line Today in 2011, 2013–2016.